Sidewalks on 250 Near Harris Teeter? The Rockfish Gap Turnpike/Rt. 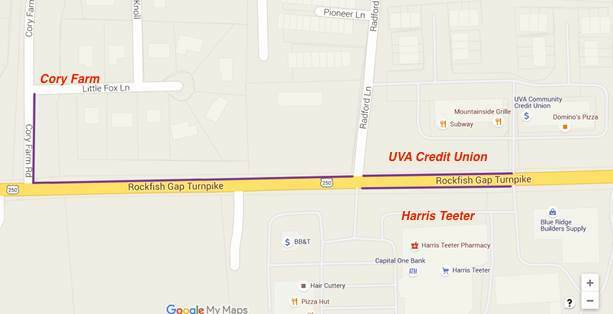 250 W sidewalk construction will take place on both sides of the Rockfish Gap Turnpike from Clover Lawn Lane to Radford Lane, and on the north side of Rockfish Gap Turnpike from Radford Lane to Cory Farm Road, and along the east side of Cory Farm Road from Rockfish Gap Turnpike to Little Fox Lane. Trying to be realist here – that schedule is fantasy. More likely 2019-2020 look how long it took to get sidewalk widened to Crozet Elementary. Ann asked yesterday why staff missed deadlines that would have funded things earlier. Yes, it’s a good thing and needed. Kinda hard to take you as a realist since you are anonymous. pathway to the Field School is a great achievement of local Govt. and the source of much head shaking and laughter…. A sidewalk would be much more useful from the Westlake Hills/Westhall/Brookwood neighborhoods to Crozet park. There are tons of pedestrians walking along the road during the summer now, and with more and more homes going in, its a hairy situation that could be greatly improved with the addition of a sidewalk. I just don’t see the proposed sidewalks along 250 being of much use. A traffic light at the Teeter/250 intersection would probably be a good thing at this point though. That intersection is dangerous, as evidenced by the regular accidents.